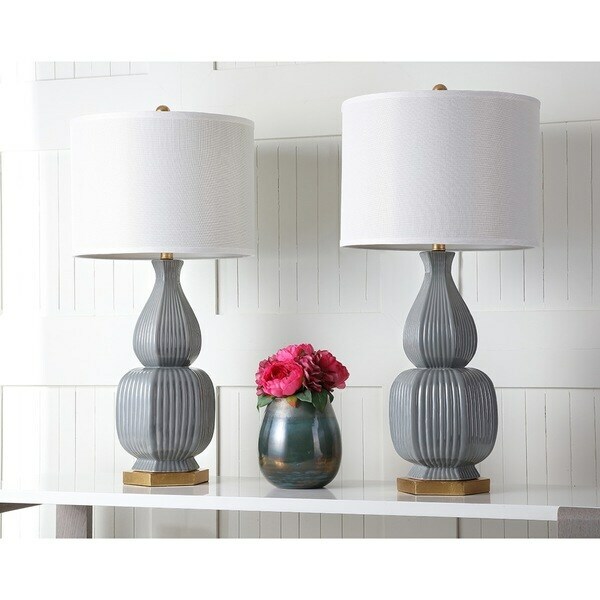 We love this elegant gray lamp with graceful lines. The shade is plain white, but it's okay, we're replacing it with an embroidered shade with lots of character to play up the lovely lamp base. These look so high end! neutral and modern.. yet timeless design. I’ve been very impressed with all the safavieh products I’ve ordered. The lamps came quickly, they are tall and beautiful. The gold color of the base offsets the over color of the lamp. Absolutely love these lamps!!! Look super expensive and the grey color os gorgeous! Then the gold accents really finish the look. Tried to get more and they had sold out that quickly. Looks much more expensive than they cost. Looks great with blue bedding. Gorgeous lamps. Good size and quality. Exactly like they look online. The gold accent really makes the gray pop. The white shade makes it match any color scheme. These lamps are quite tall but look nice in our guest room. The gray ceramic bases and linen shade look very nice. The gold trim on the base and knob on the top look fine, but not as good of quality as the rest of the lamp. I would buy again. I purchase these lamps and they look absolutely beautiful in my bedroom , I recommend these lamps. Lamps are beautiful, I purchase for my daughter she loves them! they look even better in person.The lamps were shipped on time with no damage . Great look great price.I would recommend . Great living room lamps. Nice quality. Only regret was they do not have 3way switches. Great product for the price. Came quickly ,too. Very nice. They look more expensive they I paid. The pictures made this product look like a good fit for my guest room and the reviews were positive. It appears to be a good quality and value. The style suites our decor and the size is what I was looking for. We've had good experiences buying several items here and decided to give these lamps a go. "Hi. Is this particular lamp priced for 1 lamp or a set of 2 lamps? " This listing is for a set of 2 lamps. This price is for two lamps.